One of the things I like about granola bars are that they are convenient, not messy, and can address snack cravings all in one rectangular package. They can have nuts, chocolate, raisins, or even all three combined into one tasty bite. However not all granola bars are created equal – especially when you start looking at granola bars that target people who are trying to eat healthier or even organic. I’ve been surprised at the number of granola bars that have sacrificed taste in order to be called healthy. Fortunately, Nature’s Path has been able to retain tasty flavors in their granola bars while still being USDA certified organic. From Mmmaple Pecan to Lotta Apricotta to Chococonut, Nature’s Path granola bars are a flavorful organic snack option sure to satisfy any craving. Featuring new flavors – as well as tasty upgrades to old favorites – the granola bars are a great snack, breakfast or on-the-go option. Like all Nature’s Path products, the granola bars are USDA certified organic, which means they don’t contain artificial preservatives, additives, genetically modified organism (GMOs) or synthetic pesticides, making every bite a delicious one. When it comes to the Peanut Buddy, think peanut flavored rice krispie treats with pieces of peanuts. I’m not even sure what happened with this one – I started eating it and the next thing I knew it was gone. I literally looked down at the bar in my hand and wondered who ate my granola bar. This was the mildest of the three, which was a little surprising to me. Dark chocolate usually has a distinct bitter-sweetness to it, but in this bar, the chocolate was a much subtler flavor. I couldn’t detect a distinct coconut flavor or texture, which goes to show how well they blended the flavors together in the bar. The bar has a great chewiness to it and I could definitely taste the peanuts and the saltiness. There are peanut halves mixed into the bar with a layer of dark chocolate on the top. Depending on how you take the bite (meaning which side of the bar touches your tongue first) it can either be mostly salt or mostly sweet. Of the three, this was definitely my favorite. Sweet, salty, and satisfying! I think one of my favorite things about the Nature’s Path Organic Granola Bars is the texture. This granola bar wasn’t too hard or too soft – which is important for me since I don’t like mushy bars or ones that you have to break your teeth on to bite. Another thing is that I understand the ingredients list. It is so refreshing to actually know what goes into my snacks, so when I see “granola” and “roasted peanuts” listed, that’s always a plus. In addition, all of the bars had tons of whole grains (9g to 12g), have 0g of trans fat and are low sodium. 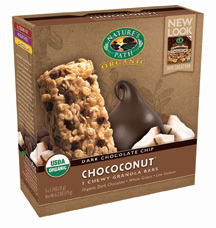 Overall, the Nature’s Path Organic Granola Bars were tasty and satisfying treats. In the comments below, tell me which of the Nature’s Path flavors you’d like to try the most and where you enjoy your granola bars. Giveaway ends at 11:59 PM EST, October 28, 2010. Note that this giveaway is open to US and Canada residents. Disclaimer: This post consists of my (and/or fellow tester) opinions only. No compensation was given for this review/giveaway. I did receive Nature’s Path samples from the manufacturer or representing PR agency to use and test for the purposes of this review. This did not affect the outcome of this review. I’d like to try Mmmaple Pecan. I always grab granola bars to go, have them in my bags and cars whenever and whereever a quick fix-up needed. I’d like to try the Peanut Buddy! 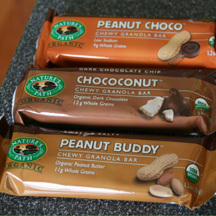 I most want to try Peanut Buddy and I enjoy granola bars on public transportation! I think I would go with the Choco_Nut bars..I love the sweet and salt combo..I would be eating them on my bike rides as I don’t own a car anymore (yeah me) and it is my transportation now!! I would like to try the peanut choco bars. I eat them anywhere!! peanut choco looks to be wonderful!! Peanut Choco for sure. I love bars for breakfast. I would like to try Chococonut! I enjoy granola bars in the morning in the car! I’d like to try the Pumpkin Spice–the taste of spiced pumpkin is one of the most comforting in the world! I’d love to try the Chococonut all my favorite flavors in one bar. I usually eat my granola bars while rushing between the 20 things that I’m doing. I would love the Peanut Choco Granola Bars. I enjoy granola bars for breakfast and in my car. Thanks for the giveaway! I’d try the Peanut Buddy Granola Bars. I want to try the Chococonut, sounds yummy! I’d love to try the Chococonut Granola Bars. I usually have a granola bar when I’m on my break at work. The mmmaple pecan sound delicious. I would keep them in my desk at work for a quick mid-morning snack. Mmmaple Pecan would be my favorite flavor. I love to eat granola bars because I feel (sometimes mistakenly) that I’m doing my body good. I’d like to try the Pumpkin-N-Spice Granola Bars the most and I usually eat granola bars at home for snacks or on the run in the car. Thanks! peanut choco , eat at work for lunch. I most want to try Peanut Buddy and I enjoy granola bars on in the bathtub! Anything with peanuts and chocolate has got to be good – Peanut Buddy for me! Choconut would be my fav. I love them on roadtrips. Hits the spot. I want to try the Pumpkin-n-Spice first. My favorite is the Peanut Choco Granola. I would love to try the Peanut Choco!! and I am sub to your email subscriptions. I’d love to try the Chococonut. My favorite chocolate is dark! Thanks. I would like to try Chococonut. I eat them in my lunch. I’d like to try the Berry Strawberry the most, even though I’m a chocolate lover. I like to eat them at home in the late afternoon to hold me over until dinner. mmmMaple Pecan sounds good, but I’m very intrigued by the Sunny Hemp flavor! I would love to try the peanut choco. Yum!!! I would love to try the Chococonut!! Peanut Choco looks super awesome! I would love to try the Peanut Choco because it looks delicious AND nutricious. Peanut Buddy. I enjoy the bars for a breakfast snack at work. I would like to try Pumpkin n’ Spice. That sounds like a really unique granola bar and very much in keeping with the season. I’d take it to eat on a hike. I would try Chococonut first. I think I’d probably enjoy the Peanut Buddy the most! The pumpkin N spice is perfect for this time of year! I would like to try chococonut because I am more of a fan of chocolate. Pumpkin Spice sounds delicious for fall! I’d love to try pumpkin-n-spice! I eat a granola bar at work nearly every other day but I’ve never tried this brand. It looks good. I’d love to try the Chococonut since I love anything with coconut in it! Granola bars are great as a quick snack when traveling for me. I’m also a subscriber by email. I’d like to try choco-nut. I eat granola bars for breakfast if I don’t have time to sit down and eat. As Homer would say…Mmmmm Chococonut! I would love to try the Peanut Choco granola flavor. I would LOVE to try the Chococonut flavour, and would eat it while watching a great movie. I would most like to try the Choconut flavour. 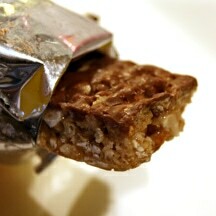 I would really like to try the Peanut Choco Granola Bars especially for lunch. Thanks for the chance to win. I’d like to try the berry strawberry one. I want to try peanut buddy! I’d like to try the Peanut Choco Granola Bars and I eat granola bars when I’m at work. I follow you on twitter. Love Peanut Choco! I’d love to try Mmmaple Pecan, and I enjoy my granola bars while I’m hiking. I’d love to try the MMMaple Pecan Granola Bars. I usually have a bar in the car, in the diaper bag and in my purse. We eat them as a quick snack. I would like to try “Chococonut” the most because I love chocolate and coconut! I enjoy my granola bars first thing in the morning because it makes for an easy breakfast when I’m rushing to work. Thanks! I want to try the Chococonut. I think it would be the Peanut Buddy Granola and the Berry Strawberry Bars. See…I tried to pick one and could not. I would eat them while hiking. I would like to try the choccoconut and I would try these on the go – especially going shopping. i would love to try the peanut buddy it sounds soooooo yummy! I AM AN EMAIL SUBSCRIBER!!!! I would loveto try the Peanut Choco Granola Bars and I love eating granola bars after I workout! The Peanut Choco flavor sounds great! I frequently eat granola bars at my desk as a snack at work! I would love to try the Pumpkin n Spice. I haven’t seen these in the stores yet, but I am definately going to looking for them. I like to eat granola bars when I am at work because it helps me fight off the urge to buy junk from the vending machine when 3 oclock comes around and I feel the need to snack. I would like to try the Chococonut one at work for an afternoon snack. The Pumpkin-n-Spice would be my favorite! I usually have granola bars at work. I’d love to try “Chococonut”. I have one every day as a 3:00 snack. Thank you for the chance to win! I’d like to try the Chococonut flavor. I like to take granola bars to work to eat at lunchtime. I would like to try the Berry Strawberry Granola Bar. Thanks for the giveaway. I’d like to try the Chococonut Bars band I like to eat themat home or in my car for a mid-afternoon snack. I would like to try the MMmaple Pecan–I like to take them with me when I go golfing. I’d like to try the Sunny Hemp… sounds like it would be great energy for my hikes and bikes (where I usually eat granola bars). I want to try Chococonut! I enjoy granola bars in the car on the go! I’d like to try the Peanut Choco Granola Bars! That’s a tough question – they ALL look good! I’d like to try Pumpkin-n-Spice. I like to bring granola bars to work and have them as a snack while I’m working. The Chococonut one looks delicous, as does the Pumpkin and Spice. I eat granola bars as a mid-morning snack at work. I would most like to try the Pumpkin and Spice bars. I eat granola bars at home and take them with me when I’m out. I eat them everywhere. Let’s be seasonal and start with pumpkin ‘n spice. I would like to try the Pumpkin-n-Spice. Sounds perfect for fall. The Chococonut sounds so good. We have granola bars as snacks all the time at home. The berry strawberry one would be nice! Thanks for the great giveaway! I subscribed through this website. I always keep a couple of granola bars stashed in the glove box so I’m not tempted to get fast food when I’m out and about. I would love to try the Choconut because coconut is my favorite! I would love the pumpkin n spice. I’d like to try the Pumpkin’n’spice! Peanut Choco, as they are my two favorite flavors. Most often the car, as on the go I realize I have not grabbed something to eat until getting in the car. Peanut Choco would be my flavor of choice: I would enjoy this on a hike! I would love try the Berry Strawberry Granola Bars and I would enjoy my granola bar at the gym and at work on my break. Mmmaple Pecan sounds like the best with many good ones. I eat in the car or work; whenever I have time and need a snack. I’d try Berry Strawberry first – love those flavors! I like to have granola and fruit bars for breakfast. Peanut Choco sounds the best to me, I would eat them for a snack at home. Thanks! I would love to try the maple pecan! Two very delicious flavors that could only be even better mixed together! I pretty much always have a snack bar of some sort in my bag so I can enjoy it whenever and wherever I am. yum, I’d love to try the MMMaple Pecan Granola Bars ! Shhhh- don’t tell, but I’d like to eat them in the library!! I’d love to try Berry Strawberry and I would eat them in the car. I’d like to try the pumpkin and spice flavor plus the lotta apricotta. I’d eat them while surfing the computer in the afaternoon. Thanks. I like the peanut choco ones and I use granola bars for my lunch at work. I want to try the Peanut Choco and I’d enjoy them at work. I enjoy granola bars in the privacy of my own home. I would most like to try choconut.